Jarrod Burch is an attorney with The Mabra Firm, where he is managing attorney of the firm’s Tifton, Georgia office while also maintaining an active Atlanta practice. A native of Sylvester, GA, Jarrod is proud to lead the Mabra Firm’s South Georgia office. Jarrod is a proud veteran of the United States Army, where he received several medals and honors in recognition of his service. Prior to joining The Mabra Firm, Jarrod spent a decade in the classroom as a legal studies professor, where he taught and researched in the areas of personal injury law, federal and state courts, and political law. He also worked with several local and state lawmakers, including as Chief of Staff to Ronnie Mabra during his tenure as a Georgia state assemblyman. 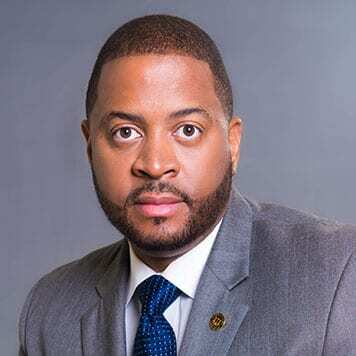 Jarrod received his Juris Doctor from the University of Georgia, where he was on the school’s champion Moot Court and Mock Trial teams, and received his Bachelor’s from Albany State University, where he served as student government president. Burch, J. Simple Campaign Strategies for First-Time Political Candidates. Fayette County Democratic Committee. (2013). Burch, J. [Textbook Development Team and Reviewer] Jennings, M., Twomey, D. Business Law: Principles for Today's Commercial Environment (3rd ed.). Mason, OH: Cengage. (2010). Burch, J. The Relaxation of Sunday Blue Laws in America, An Analysis of How State Courts and Legislatures Have Gradually Relaxed Enforcement. (2010). Burch, J. Law School Admission: From National Rankings to Race-Based Admission to Online Law Schools. Black College Today, Volume XI No. 4. (2005).